click here Michael Strassfeld, Richard Siegel, Sharon Strassfeld, The Second Jewish Catalog: Sources and Resources. Jewish Publication Society of America, 1976.
click here Michael Strassfeld and Sharon Strassfeld. The Third Jewish Catalog: Creating Community: With a Cumulative Index to All 3 Catalogs. 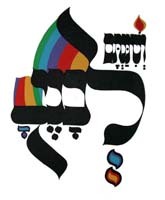 Jewish Publication Society: First edition, 1980.
click here Yosef I. Abramovitz and Susan Silverman. Jewish Family and Life: Traditions, Holidays and Values for Today�s Parents and Children. St. Martin�s Press, 1997.
click here Anita Diamant. How to Be a Jewish Parent. Schocken, 2000. CAJE - The mission of the Coalition for the Advancement of Jewish Education (CAJE) is to promote excellence in Jewish education across the spectrum of Jewish life. The Jewish Fund for Justice has developed a curriculum unit to teach middle school students in Jewish day schools and synagogue religious schools about the injustice of poverty and the Jewish mitzvah of working to eradicate it.